Week 9 share. Mushrooms not included. **Subscribers at Woodson and Bel-Ridge will receive a sun jewel melon today. Due to recent rains, some of the melons are splitting, even in the fridge. We encourage you to use them quickly in case they happen to split. As for flavor, each melon varies, but some aren’t especially sweet. Some are even a bit salty. We’ve heard reports of the same being the case with other melons this year. This melon’s texture is currently the standout feature- a refreshing, crisp one hard to come by. If your melon seems to make the journey home intact, leave it on the counter to ripen. After cutting, most prefer to refrigerate them. My personal preference is to place about 1/8” of water on a medium plate, crosscut the melon, and set the flesh into the water. This will keep the fruit flies out, flavor in, and texture as you want it to be. Cucumbers: Thanks to our Crop Mobbers for harvesting. Some cucumbers are from a fresh planting, some are the last round of the old planting. In order to give them to everyone, we had to pick from both. Give a taste to see if they need peeling. 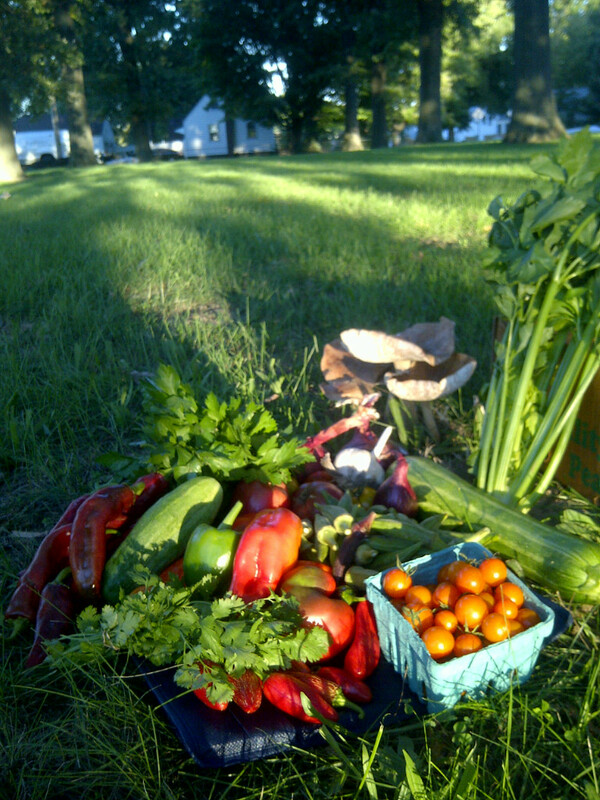 Farm dinner and cooking class is next week, Tuesday, September 25! Give us a call so we can save you a spot. We hope you all enjoyed and benefited from Randy’s feature article in last week’s newsletter regarding our stance on organic. We’d be happy to make it into a conversation with you. You know where to find us. We’re in a transition time. If July and August hadn’t been so hot, we’d have fall offerings as the summer crops slow down. But as it was and now is, tomato production is next to non-existent. Bell peppers seem to be in no hurry and eggplant is on vacation until warmer times. We are doing our best to give you tomatoes, but they just aren’t holding up on the vines or in storage. The sudden rains and humidity over the last couple weeks really had an effect. I believe our field was more shocked by the sudden rains than those in West and South Counties as here we missed a few of the light summer rains that other farms received. This compiled with July blossom drop from the heat gives us what we have. Thanks to everyone who helped us put together and attended the Crop Mob this weekend. We had a great time and got some things done, such as transplanting, weeding, spreading compost, and harvesting the biggest sweet potatoes we’ve ever seen, before enjoying a tasty lunch. The event also brought us a spotlight from three local news channels. Thanks to NewsChannel 5, Fox 2, and Channel 4 News for their coverage of our project. Our Seeds of Hope Benefit Event is next week! If you or someone you know would like to support us by attending or donating an item for auction, please let us know. Tickets are available through Randy or I, and online at seedsofhopefarm.org. We’d really like to be offering more and smallerzucchini per share. But the plants just don’t seem to be into it…maybe more next week. We hope you all tried last week’s recipe. I ate it about 4 times. That recipe was an offering from Jehad Almaharmeh, Farm Apprentice. Jehad is from Jordan, and has brought some great offerings to the farm table. This recipe is his too. We have been prepping this recipe with lots of tomatoes and some cilantro. I happened to find the same thing in Helen Nearing’s Simple Food for the Good Life, only with less tomatoes and parsley in place of cilantro. With this week’s small availability of tomatoes, we’d recommend it as its own side dish. It can work served with bread or over pasta, if you are generous with the oil. Amounts: Jehad and I don’t tend to measure. If I had to put numbers on it I’d say lots of oil, .75 lb onion, 4 anaheims, 4 jalapenos, 1 lb zucchini, 4-5 cloves garlic, 5 or 6 tomatoes. Closed fist full of chopped cilantro . Two fists if using parsley. You know your cutting speed and stove heat up time better than I, so we’ll list prep and cook separately. The way I do it is cut onions while oil is heating, and cut the rest while the onions cook down. Adjust steps accordingly to meet your comfort zone. Prep: Cut zucchini into about one inch chunks. No need to peel. Cut onion into strips about ¼” wide. Peel 4 or 5 garlic cloves. Smash to release flavor. Dice tomatoes. Cut cilantro at the last minute. Cook: While you have some olive oil heating in a pan at medium to medium high, cut up some onions. Maybe a pound (your share weight) or so. Toss them into the pan, (if using hot peppers add in whole at this time) cook until onions soften, then add garlic. Give it a minute, and add zucchini. Sautee and stir. When zucchini looks soft, turn heat up and add tomatoes. Cook until thickens, when desired thickness is reached add cilantro or parsley and salt (and/or pepper) to taste. Remove the celery hearts and save them to use in salads. Chop the remaining celery, including the leaves. Set the leaves aside for garnish. Heat the butter or oil in a medium saucepan, and sauté the celery and potato. Add the stock or water, and bring to a boil. Simmer for 45 minutes, or until the celery is soft. Add the sea salt and the nutmeg, and garnish with the chopped celery leaves just before serving. Variation: For a creamy celery soup, cook the soup as directed above; put it through a mill or a sieve, or blend it coarsely, adding more water if desired. Next Post Catch our recent news coverage!! Wonderful post Mr. Hahn! I enjoy the life you bring to words!